When I was much younger, let’s say twelve or so, on a family trip to Walt Disney World, I watched the film Impressions de France in the France Pavilion in Epcot (then called EPCOT Center). All of that was new at the time and I hadn’t really seen any films about foreign countries. I wasn’t much of a watcher of stuff back then. That is, unless it was cartoons or football. But, this film was amazing. It started a love of foreign adventure that I never realized until I was in my forties. One of the things that I saw in the film was an island that looked like it had a castle on it. I didn’t know what it was but it was magical. At least it looked that way. I was mesmerized by it. I told myself: I will get there someday. Oh yes! I will get there someday. We went back to WDW for Christmas in 1989 and at 19 saw it again. This is way before Google or Wikipedia. I still didn’t know what it was and I truly didn’t think to ask one of the young French cast members about it. Again in 1995, 1996, 1998, 2000, 2001, 2002, 2004, 2006, 2008, 2011 and 2012. It should be obvious that I like going to WDW. Anywhat! I was watching one of the travel shows (such as Rick Steves, Rudy Maxa, etc.) and it was showing monasteries around Europe. I saw this remarkable and longed for island fortress and it had the name on the screen. I had truly forgotten about it until I saw it here sometime in 2012 (probably recouping from heart surgery) and a rush of excitement slapped me in the face. I knew what it was! I knew its name! Its name: Mont Saint-Michel (St. Michael’s Mount). I reiterated to myself: I will get there someday. Oh yes! I will get there someday. Fast forward to 2013 when a FAM (that’s a familiarization trip) to Europe came my way this included finishing in Paris. I was able to add a few extra days there and was able to take The BCPF, as well. Whilst scheduling what was going to happen, I inquired about Mont Saint-Michel and there was a day excursion to the attraction. I jumped on it. It was a fourteen hour round-trip day excursion, too. We were on a bus for four hours both ways and then spent time at the visitors center a few miles away from the island where we had a fancy omelet and other local delicacies. We then jumped on a shuttle and went to the island. I stood at the base of the island and, I’m not afraid to say, cried. I had waited just about all my life to see this; something I swore I’d see and visit. It was a long and not-so-easy trek up the stairs to the top. We had a tour guide that spoke to us in French, Italian, Spanish and English through a transmitter/receiver system (she seemed to never skip a beat in switching between the languages). Mont Saint-Michel, a wonder of Gothic architecture, was first built upon in the 8th Century AD and is located in the Normandy region of northern France, at the mouth of the Couesnon River. The structure as it stands now started in the 10th century and was completed in the 16th century. It’s almost 250 acres and boasts a population of around 44 residents in addition to the 11 practicing monks that are permanent occupants of the monastery (those are number accurate to the time of our visit in 2013). There are hotels, shops, restaurants and museums on this magnificent mountain. At the top of the monastery is a beautiful cloister with a medieval garden that looks out over the water as well as other parts of the structure and is where the monks actually meditate. There’s landings and platforms that allow for glorious views of the bay. At the very top, there’s a spire with a statue of St. Michael at the peak. It also still operates as an active church. There are crypts and choirs, tunnels and chambers. Architecture here is some of the most beautiful I’ve ever seen. And, I mean ever. One of the most unique aspects of this “island” is that when it’s low tide, you can walk on the sea bed. This was an important facet over the millennial history of the edifice. Pilgrims would cross via foot at low tide from the mainland. If they waited too long, they’d be stranded on either side of the bay until the next low tide or until they hired a boat. At the same time, it helped in the fortification of the compound. It would create a difficult target because ships would have to wait until high tide, giving the inhabitants of the island time to prepare. Or, if at low tide, the opposition could trek across the seabed but would have to be quick or get stuck on the island and at the mercy of its people. It wasn’t always a church/monastery, it also served as a prison (because of its fortification and the reverse) and it withstood two English sieges due to the reinforcement. When we were there, the causeway was being removed in favor of a bridge that would allow the mount to return to an island. That didn’t take away from the glory that is Mont Saint-Michel. I hope to return another day to see this again. How about you, Dear Reader? Have you been there? Do you want to go see it; experience it? I can certainly send you there. I can assure you that you’ve never seen anything like it. Contact me to ask me how you can get there. I’ll help you. All of France is definitely worth being in. But, this, even to a non-spiritual person, was very spiritual. Today is the 126th anniversary of the opening of Paris’ iconic Eiffel Tower. The BCPF and I have been to Paris twice and we both consider it one of our absolute favorite cities, if not the favorite. It’s a beautiful, historic wonder that holds our hearts. The Eiffel Tower (or Tour Eiffel in French) opened on March 31, 1889 on the Champ de Mars as the entrance arch of the 1889 World’s Fair. It was designed and built by Alexandra Gustav Eiffel and then it was named after him. It is truly a sight to behold standing in front of it or under it. I can only imagine what it’s like to stand on it but we didn’t do that either time we were there. We had other things to do and standing in line for this was not what we had in mind for a good time. Maybe the next time. One thing to see is when the sun goes down, and the lights come on, every hour for 5 minutes, it does the Tour Eiffel “Flip Out” as I’ve come to call it. That’s when the lights go all a-flutter. I really recommend seeing it. I included a video of this in a post for the Honeymoon Chronicles. Read that post here. Anywhat! Joyeux anniversaire Tour Eiffel and many, many more! Bonjour, mes amis. This is Day 3 in Paris! Oui, oh oui! When we last left the blogosphere of The Honeymoon Chronicles, The BCPF and I were wandering through the streets of Paris seeing the Eiffel Tower and watching some dude water the ivy on the garden wall. 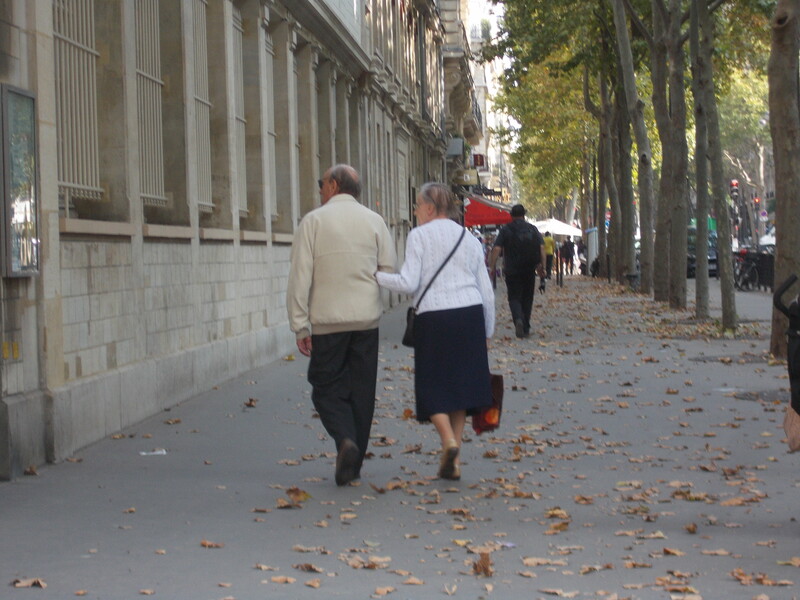 One thing I did forget to say was in our street touring we ended up behind an older/elderly couple that were walking through the streets holding hands. They seemed to be natives and looked happy and content. I told The BCPF that that would be us in about 30 years. I had her take a picture with her digi-obscura and you can see the result here. This day was something that I had been waiting on. We missed the opportunity last year and this year, we weren’t going to miss it. 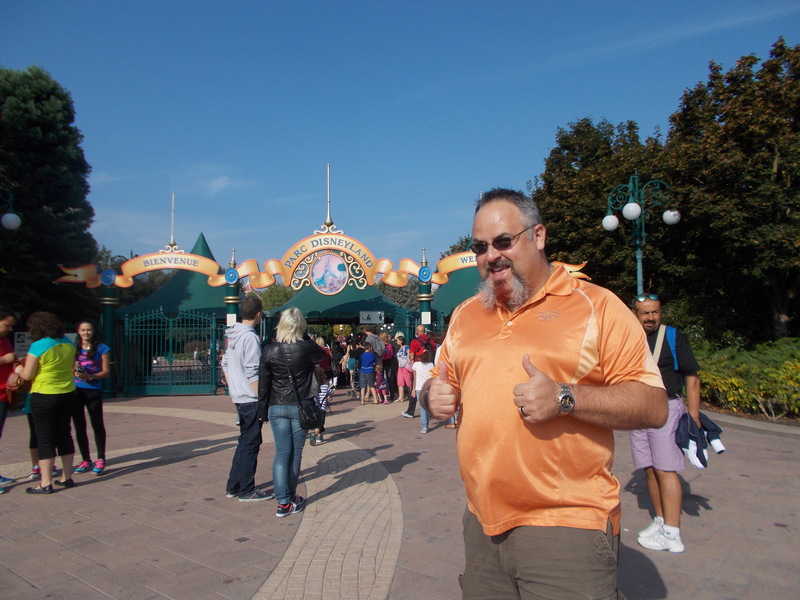 I’ve touted myself as a Disney guy over and over and over, and I’ve been to Walt Disney World fifteen times! So, it just seems natural that I’d visit other Disney theme parks. And, that’s what we did on this, the third Parisian day. The way to Disneyland Paris is to find the RER A Train. RER means Réseau Express Régional or Regional Express Network. This train serves from the city proper into the outlying suburbs. This particular train was going to the Marne-la-Vallée – Chessy. That station is right at the gates of Disneyland Paris. 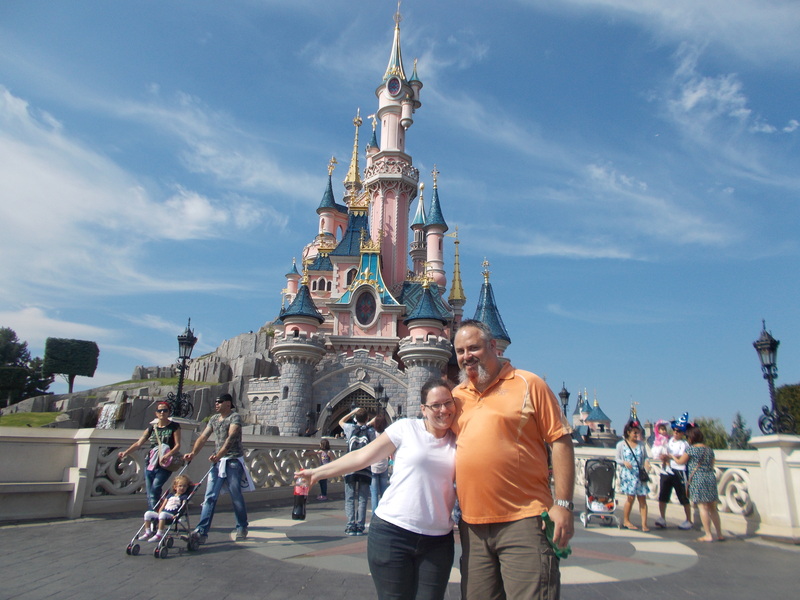 So we took our tickets that we pre-purchased and walked up to the main gates of Paris’ “Happiest Place on Earth.” Disneyland Paris is made up of two theme parks in one: the “Magic Kingdom” part and Walt Disney Studios, which is DLP’s version of WDW’s Disney’s Hollywood Studios. When we arrived, there was a giddiness that had already taken me over. When we got to the turnstiles I was about to hop them before they took the tickets. But, I didn’t. I held it together. Once through, though, I had settled down a bit. It looks a lot like the Magic Kingdom: firehouse, confectionery shops, outlet-like shops, and even a Casey’s Hot Dog shop. Casey’s doesn’t open until 11a there and we were about 10 minutes early. The BCPF and I have a tradition of going to Casey’s as the first thing-to-do on every trip to WDW so why not carry that tradition on to DLP? A couple of things that are different was that the dogs – all of which are foot longs – came prepackaged and there was no “fixin’s” bar. They came how they came, either with melted cheddar and bacon or without, and that’s pretty much how it is. Paris apparently doesn’t know what yellow mustard is, only Dijon mustard. While I love me some Dijon mustard, I want yellow mustard on my hot dog. So, a couple of dogs (mine with cheese and bacon, hers without) with fries and bottled sparkling water and we’re ready to move on. Once you move off of Main Street U.S.A. (yes, that’s its name) the similarities to Magic Kingdom get a bit weird. Not dissimilar mind you, just weird. Did I mention it’s weird? Anyway, just like its Anaheim counterpart, this Disneyland’s castle is called Le Chateau de la Belle au Bois Dormant or Sleeping Beauty Castle (WDW has Cinderella Castle). As you can see the castle is pink. The inside of the castle has a few shops – glass and crystal making shop and a Christmas shop. The upstairs features stained glass windows and a spinning wheel, like the story. Underneath it there is an animatronic dragon in a grotto that is supposed to represent Maleficent. It’s actually pretty cool. You can then step out to the side and be under the bridge that connects the castle to the “land” and that covers the “moat.” A pretty and relaxing waterfall is present here as well. Not as spacious as Cinderella Castle, but appealing and interesting nonetheless. Surrounding the castle, as is the case in both Disneyland California (DLC) and WDW, is a collection of “lands” that represent various themes. In WDW (the one I’m familiar with) there is, clockwise, Adventureland, Frontierland, Liberty Square, Fantasyland and Tomorrowland. 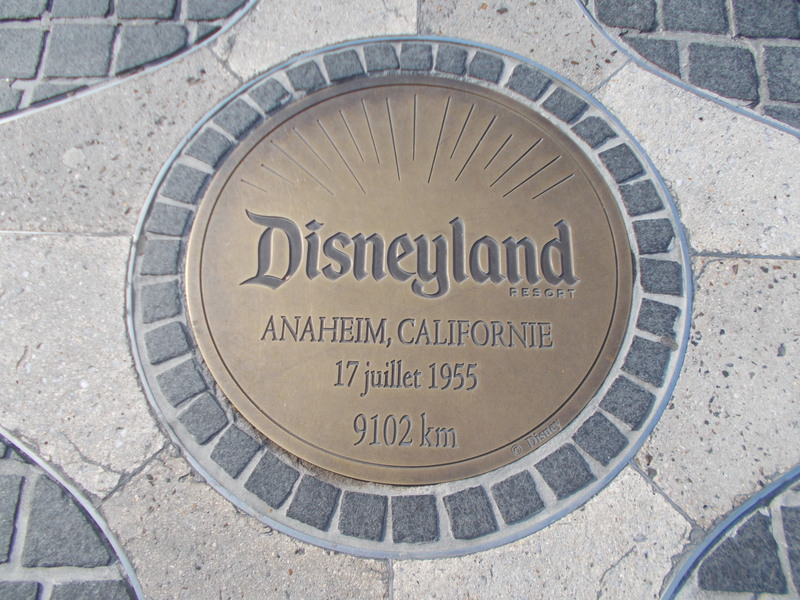 In DLP the lands are (in the same order): Frontierland, Adventureland, Fantasyland and Discoveryland. There’s no equivalent for Liberty Square, which is the counterpart of New Orleans Square in DLC. Confused, yet? It’s not rocket surgery, but more info than you’d probably ever want to know. Some other oddities to me are that the haunted house ride is called the Phantom Manor instead of Haunted Mansion, the storyline is entirely in French, and sits right next to Big Thunder Mountain; and this after you pass the Legends of the Wild West which looks like the fort on Tom Sawyer Island in WDW. Those sit in Frontierland. Then we moved to Adventureland where we saw the DLC version of Swiss Family Tree House called Le Cabane des Robinson. The Pirates of the Caribbean ride was closed. Voyages de Pinocchio. I don’t know, it just seemed like it was rehashing her ride. Also, there’s Le Pays des Contes de Fées (Land of Fairy Tales), a mostly useless boat ride around a loop that shows models that represent various fairy tales. I know that sounds kind of harsh, but really, it seemed like they just needed to stuff something in a space and this was it. The theming was nice, but really, meh. 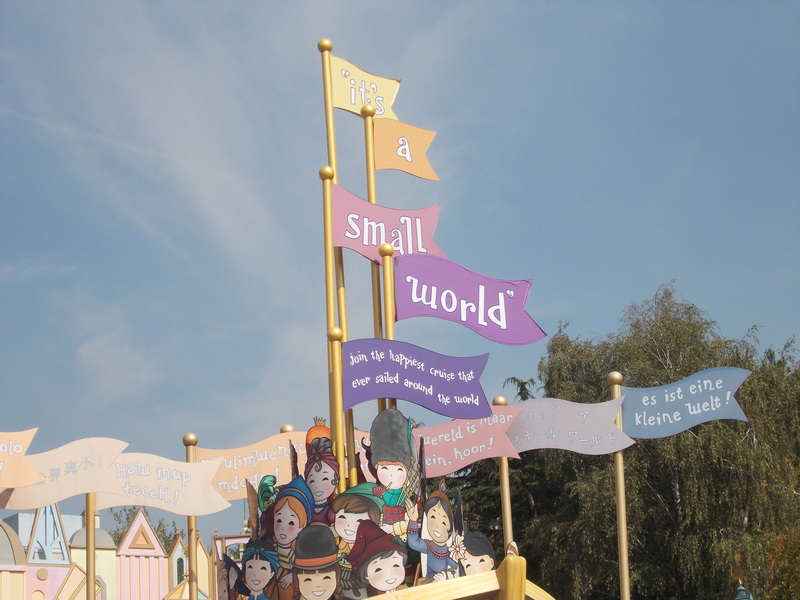 The main attraction in this land, though, was It’s a Small World. The queue is actually outside and there’s an open court that, I’m sure, lends to queue management during the busy months. The DLP version actually has some American theming that you don’t see in the American version (at least not at WDW). 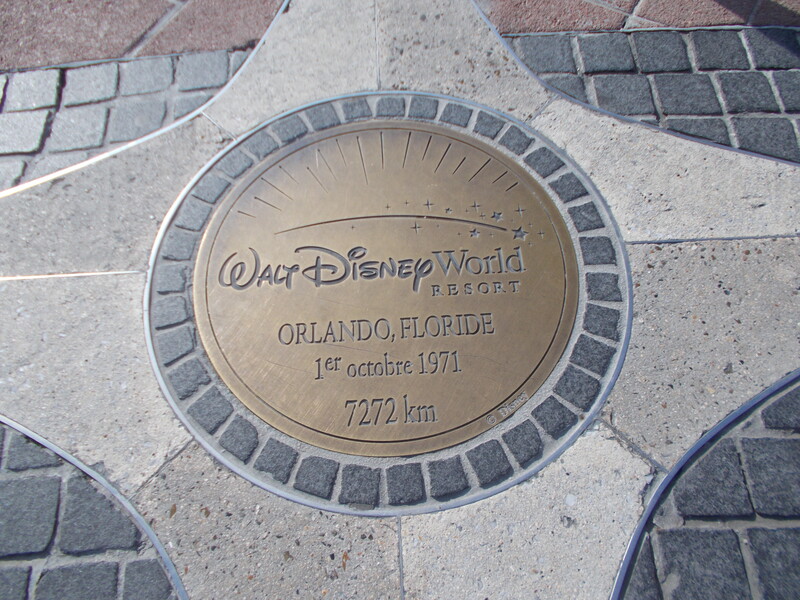 Overall, there were several things that matched the WDW, but overall it kind of fell flat. We moved on, then to the Tomorrowland equivalent: Discoveryland. 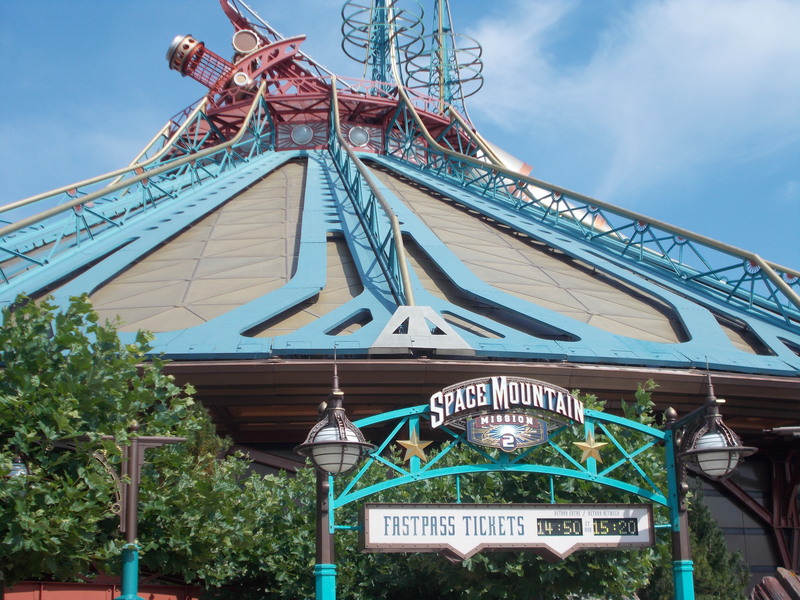 There was Space Mountain: Mission 2 and Star Tours, Orbitron – Machines Volantes (Astro Orbitor) and touching on some Epcot action, Captain Eo starring Michael Jackson. There was also a very strange 20,000 Leagues Under the Sea thingy called Les Mystères du Nautilus that was basically a “life-size” model of The Nautilus that Capt. Nemo sailed in the story/film. It was a cool, shady distraction but really I don’t get why it was there. So we decided to head over to the other park, “Walt Disney Studios,” which is kind of like a misnomer because there aren’t any studios there; not working studios, anyway. 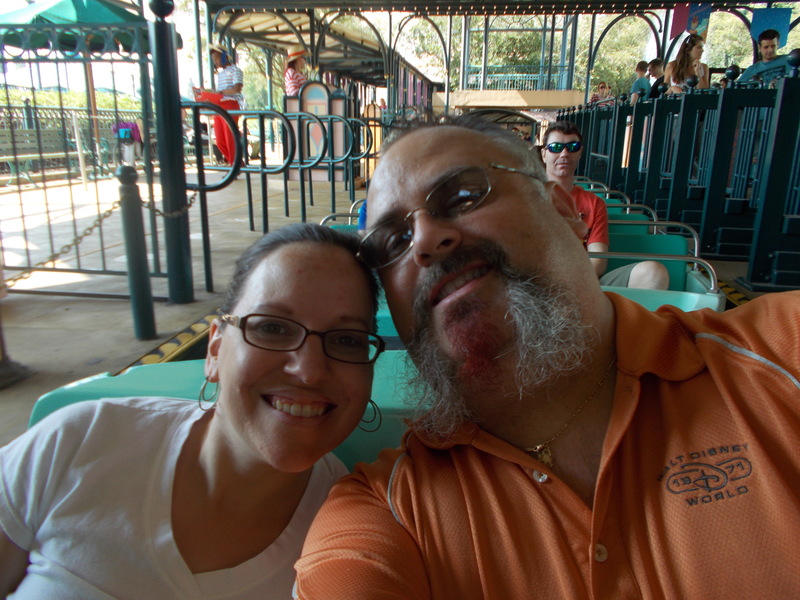 There we did ride the Studio Tram Backlot Tour which is very similar to the now-defunct ride of the same theme in WDW. We skipped around inside looking at some of the rides and comparing/contrasting with WDW. 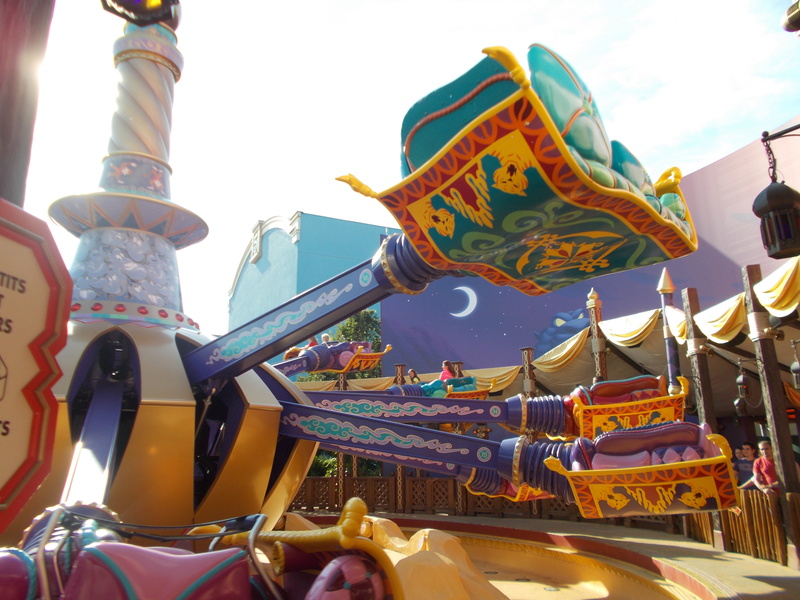 We also rode the Les Tapis Volants – Flying Carpets over Agrabah that are also in WDW. There’s a Twilight Zone Tower of Terror there. I’ve never ridden the one in WDW and wasn’t about to this time, either. Some of the other rides were Ratatouille: The Adventure (which we didn’t know anything about it so we didn’t get in line for it), Toy Soldiers Parachute Drop (like a drop zone/Tower of Terror-type ride), Rockin’ Roller Coaster featuring Aerosmith (just like in WDW), Crush’s Coaster (not riding roller coasters) and Cars Quatre Roues Rallye (bumper cars). Interesting things, yes, but nothing I wanted to ride. I’ll be honest here, I was just going through the motions mostly at this point. We’re not really “thrill ride riders” as much as we are “experiencers.” There was something of a letdown when it came to the whole “Magic Kingdom” and Studios aspect. 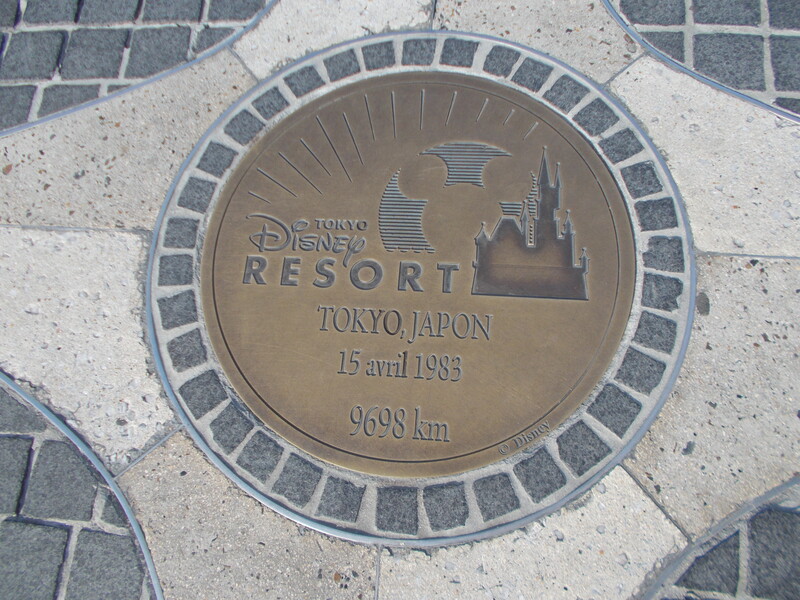 Parts of my problems were as such: The park opened in April, 1992. It seems that most of the park was still stuck there. In Disneyland Paris you can see ceiling tiles, a/c units, cobwebs where they shouldn’t be, etc. There was no attention to detail and “keeping the magic alive” happening. They were fleecing money from the consumers and tourists only. I’m not naïve enough to believe that’s not what is happening in WDW but when I’m there, I get that air of mystery; mystique. Unless you’re really looking for it, you’re not going to find many things out of place. Notice I don’t say all, that’s virtually impossible, except Disney does a darn fine job of it. The ceiling tiles in It’s a Small World are painted black with other decorations giving the perception of depth and infinity. DLP there were tiles missing and you could see the a/c above holes in the drop-tile. I know I’m repeating but the illusion is lost there. The paint jobs on the attractions are old and tired. I’m thinking there should be a push in the Disney Company to capitalize on the fact that DLP is finally profitable. You’d think they’d want to do what WDW and DLC are doing, updating, renovating, refreshing their parks. Now, all that being said I’m glad I saw it. Truly, even knowing what I know, I’d really hate to have missed seeing it. If my son wants to see it, I’ll definitely take him, in a heartbeat. However, as I said, I’ve seen it. I don’t ever have to go back. Been there/done that. I was so done with DLP that we didn’t even eat anything else there. In WDW, food is the main highlight of my trip. So that’s saying something. But, hey! I was with my new bride, so that’s awesome, too. 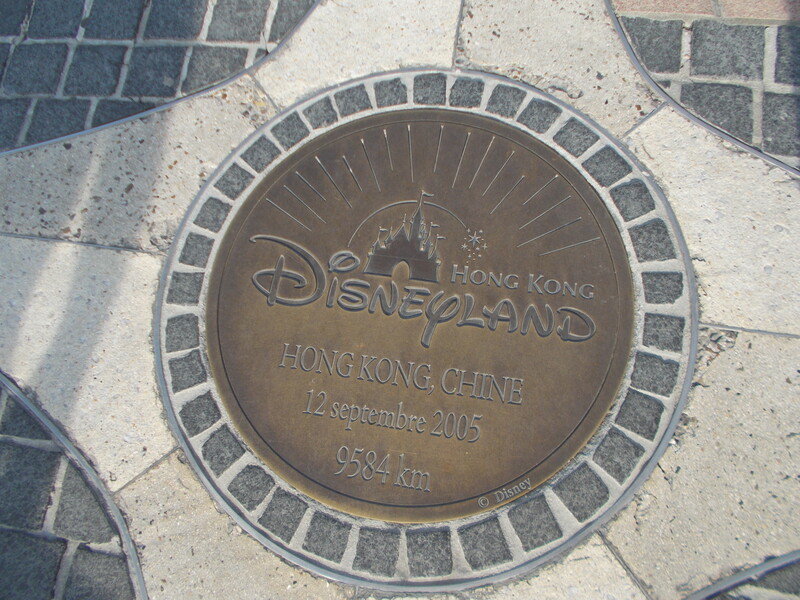 One thing that I found cool outside of the parks proper was the inclusion of benchmarks of the other Disney parks in a “compass” and I’ve included them here. 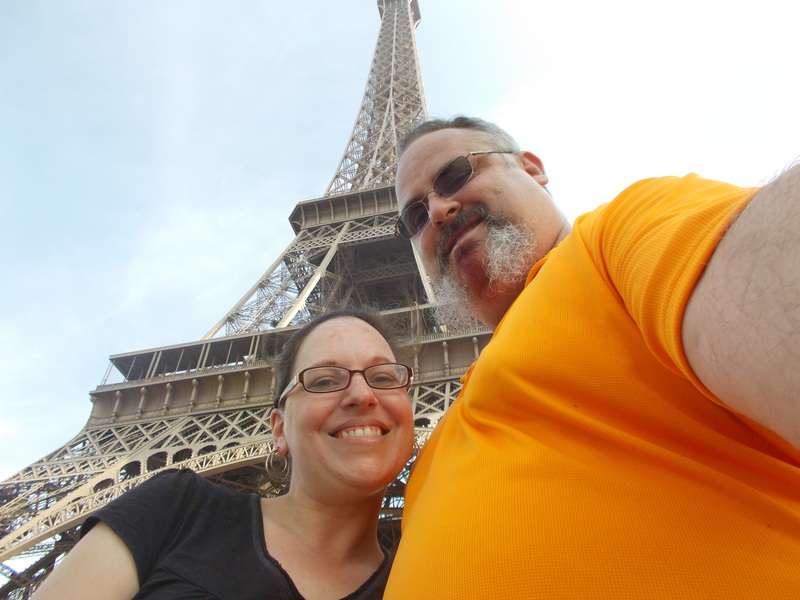 We decided to go back to Paris to see what we could find and where we could explore. That’s part of the next blog. This is already long, as it is. Next up in The Honeymoon Chronicles, it’s the most bizarre experience I’ve ever had at a restaurant. Paris is definitely one of our favorite cities. The BCPF and I have both decided that if we win the lottery, we are going to buy an apartment in one of the Arrondissements that allows us a visual of the Eiffel Tower. Speaking of the tower, this trip marked the first time that we actually visited it. We didn’t walk nor ride anything to the top, but we did stand underneath it. We happened upon it by chance after doing our customary Metro to outlying neighborhoods and traversing our way back toward the city center or whichever other destination we’ll be looking for. The oddity about that was it was the place (other than the train station) we saw an abundance of soldiers/police with machine guns. Last year, there was a plethora of police with semi-automatics canvasing the area. Kind of off putting, but it was cool, nonetheless. We also saw what I call the “Eiffel Tower Flip Out,” or a flashing/”sparkling” light show that goes nuts on the tower itself. That’s what happens every hour from sunset until 1am and lasts for 5 minutes. It started for the millennium celebration in 2000 and was supposed to only be temporary. It turns out that it was so popular, not only with tourists, but Parisians, as well, they left it. We saw this on an evening riverboat cruise of the Seine River right through the middle of the city. You can see the video right below. But, I kind of got off track; let’s get back to the beginning of Paris. Paris is called the “La Ville-Lumière” (City of Light) and it’s not because of the shload of lights that are all spread all about this beautiful city. No, dear reader, it is because it was once – and to some extent still – the center of learning and enlightenment. See? We feel enlightened every time we come here. We arrived at Paris Nord Station and were picked up by a driver to be taken to our hotel. I will say this, to get it out of the way: The Best Western Premiere L’horset Opera was the worst hotel that we saw this entire trip. Supposedly, they’re a three-star resort, but that’s pushing it. I equate it to staying at The Cow Shed in Pineville, WV two years ago, but L’horset Opera was pretty bad. The room was smaller than we had stayed at any other location on the trip. The Wi-Fi (I like to Skype with 3B and mon mere when we’re out of the country) was shoddy and that’s putting it nicely. It would come and go; work then not work, all the time I tried to use it. The showers in Europe – we’ve gotten used to this – often only has covering, usually using half-glass large enough to protect just the part where the shower head is. This had a wall, but it was very shallow and nothing else. The water would bounce off my plump body and spill onto the tile floor. We used the floor towel that one steps out on but it was usually soaked and did no good. It was always slick. The actual WC was really no bigger a hall closet. Again, to a large man like me, that makes it hard to be comfortable. The kicker for it all, however, was the morning after the first night. We went down for the free breakfast that was included with the hotel. There was an array of meats and cheeses, most of which were under a serving case, different breads, cereals and a toaster for toasting any of said breads. As I was going to get some of the cheese and meat to put on my plate, I noticed a HUGE fly sitting on a wedge of cheese and it was trapped inside this case. That turned my stomach as I have a phobia with food being old, wet (not liquid; meaning food that has gotten wet), etc. The fact that the fly was encased with the cheese made me not want anything. I had a hard time getting even my breakfast tea down. Add that to the nonchalant attitude of the front desk the day before and the other things mentioned above, and it’s obvious that this was definitely a bad choice for our stay. We chose it and I know better than to allow my clients or me to stay there again. I’ve been an advocate for Best Westerns, especially their Premiere category, but this was horrible. The only plus for it was the bed was very comfortable. But, other than one more thing that I’ll touch on in the last installment of the “Chronicles,” and that may be worse or better according to my mood when I write it, this was the worst thing for the whole trip. Let’s talk about being out and about in gay ol’ Paris. Because we were there last year, we had a respectable knowledge of the Metro and how it operates and how to navigate it. So, we bought 5 day passes (we only used four) and set off to explore the nooks and crannies of this town. Step one, head toward Notre Dame to start a tradition. We make our way to and around the famed cathedral, took in the sight of it and then crossed the river to the Left Bank. We wandered through the streets and found a music box store where The BCPF purchased a little music box that plays “Champs Elysees.” And, because I like to make sure she gets to one of the most famous bohemian bookstores, Shakespeare & Company, the music box store was a strategic coursed distraction before heading to the bookstore. It’s famous for being a hangout for Hemingway, Joyce and Pound. No, it’s not the same location but opened in a new location as an homage to the original and is still storied and famous. We wasted away that day (and loved every minute of it) and decided it was time to get some vittles, or victuals if you want to keep with the literary theme, and found a nice little restaurant called Le Lutece. I had a Grimbergen Blanche which is a white wheat, and it was delicious. 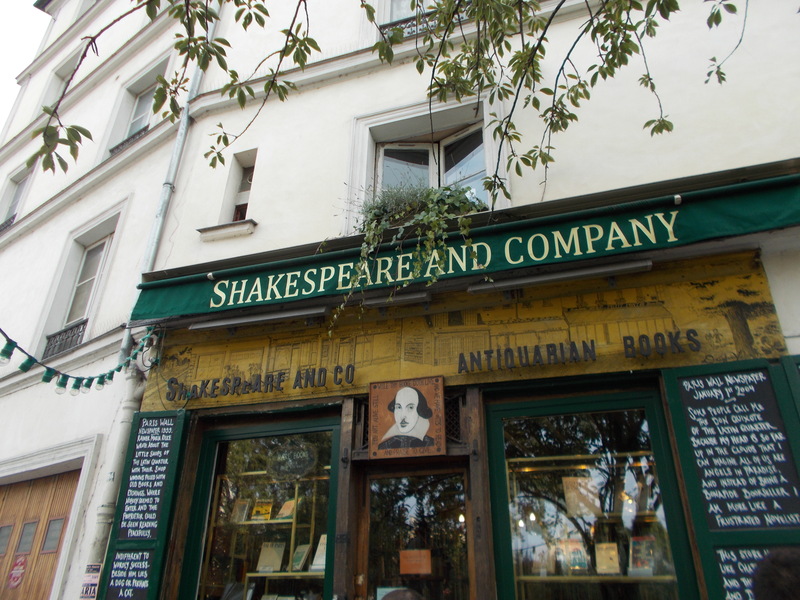 I never found it again across Paris, I’d go back to Le Lutece just to have it again. The BCPF had rosé and she seemed quite giddy about it. One thing about Paris, the house wine (really a lot of wines) is generally cheaper than either soda or even water. House wine can be about $2-3 where a Coke is about $3-4; bottled water, still or sparkling, is also $3-4. 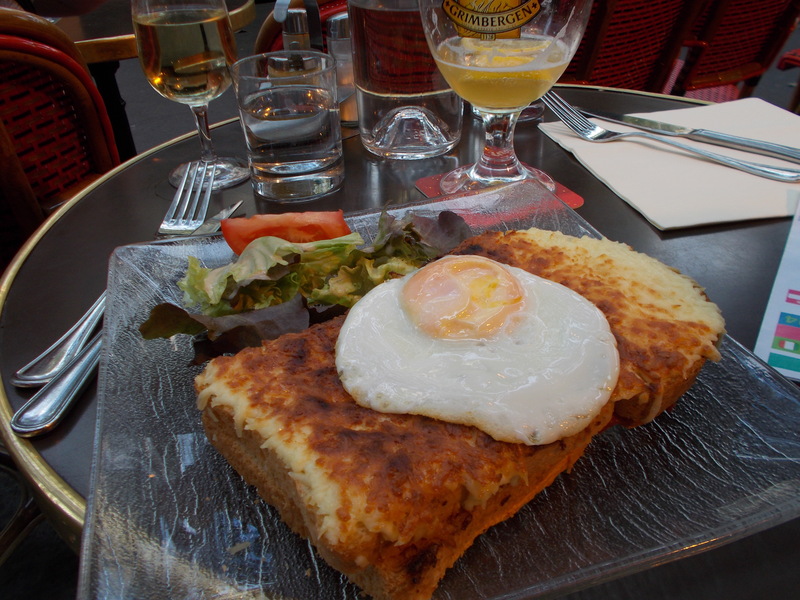 For food she had Croque Madame, which is a giant piece of bread with cheese piled on it and toasted and then a fried egg on top. For me, I will just say that I am a huge fan of beef and I’ll say that I’m a HUGE fan of raw beef. 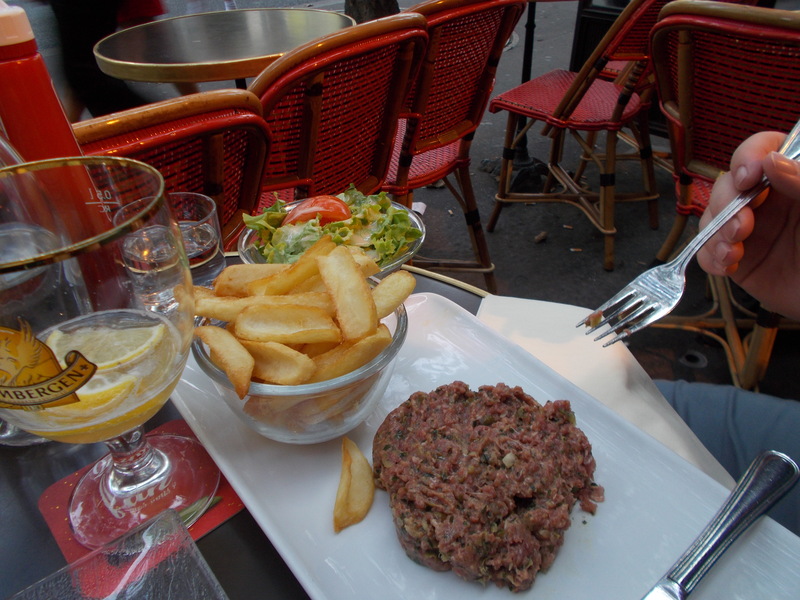 We were in Paris for 4 nights and 3 of those nights I had steak tartare. Each one tasted different and each one delicious. That’s just good shite. A good start to the stay and then we went back to the room so I could keep track of the Steelers game (it was opening day). That’s how I know she loves me, she let me track it on the computer… in Paris. Luckily, she was tired. The next day was a day of exploration as we had a tour later that night. That tour was on the Seine River cruise and observation of the “Flip Out.” But, that day, it was a lot of walking and exploring. Another thing we did was put a lock on the infamous “Lock Bridge.” This is something that I told The BCPF last year that we would not be doing. Well, even though I wear the pants in the family, she tells me which ones to wear. We put a lock on the bridge. We understand they cut them off periodically but the symbolism is strong enough to be worth it. 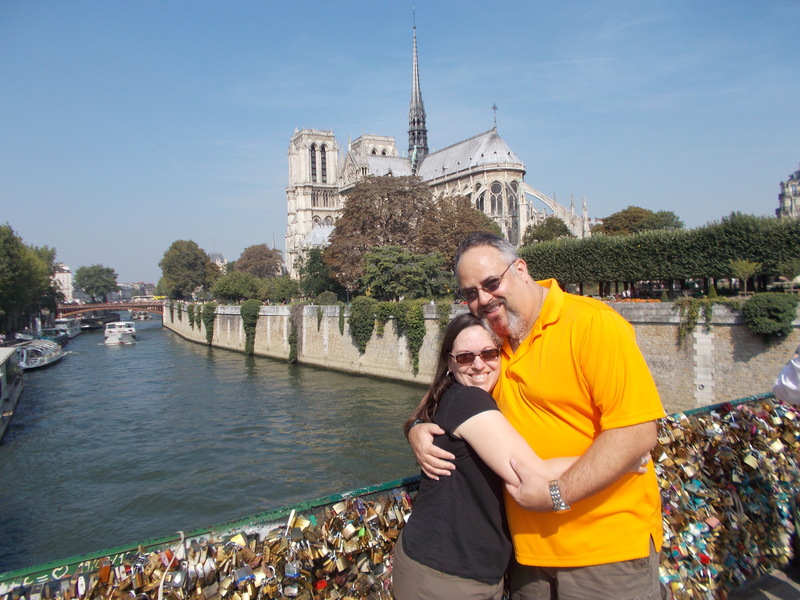 Now there are several lock bridges in Paris, I think we counted up to 8 on the cruise tour. The bridge we picked was one that was slightly behind Notre Dame: Pont de L’Archevéché. Once it was fastened, we had a nice gentleman (who had a professional camera) take a pic with our camera of me tossing the key into the Seine; also symbolic. After that we made our way, via the Metro to the Place de la Concorde, which is where Marie Antoinette and others met their demise via the horrific guillotine. 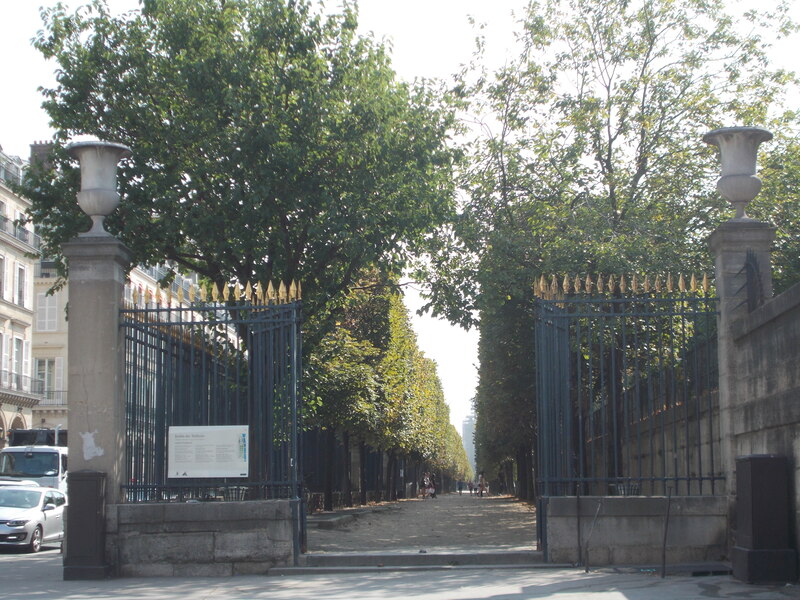 This is also an avenue to step onto the famous Champs-Elysees, which is probably one of the most famous streets in Europe, if not the world. At the other end, there is another famous Parisian landmark, Le Arc de Triomphe. We walked from Concorde to Triomphe, stopping in on some of the shops and even had lunch at a little restaurant tucked away back in a small shopping center. That’s about a mile and a half and it’s a 3 foot higher difference at Triomphe than at Concorde so there was a grade. It was a good walk. The BCPF had some things in mind that she wanted to purchase and we looked for some of these things. That’s how we ended up at the Eiffel Tower and then strode a long, long distance looking in shops and then to find the location of the tour company. We found that but had about 90 minutes before we had to be back. So we visited an old favorite. Last year we stopped, oddly enough after a tour with this same tour company, at a charming restaurant called Royal Opera. We did so again, this year. It was the only “repeat” we did. Again, beef tartare for me and duck for her. With beer and wine, we’re happy campers. Then the river cruise. The river cruise was cool but really nothing to talk about that isn’t just a lot of stuff on a river. Stories was translated for us and we were told what some of the buildings and structures were. The remarkable part about this tour, though, was twofold. First we’re on a double decker bus traveling through the Place de la Concorde on the way to the Eiffel Tower and here, against a wall in the (the garden of tiles and garden that is adjacent to the Louvre), was a man answering nature’s call. There. In front of traffic and this double decker tour bus with people looking on. The funny part about that is his girlfriend (they were both dressed fairly nice and casual) was standing behind him just smoking a cigarette like nothing was happening. He finished, tucked away Mr. Happy and then turned around – facing the public – to close, button and zip his pants and then buckle his belt. We felt that was ridiculous and ridiculously funny. The other part of this twofold tidbit is the fact that there are very few traffic lanes marked in Paris. What we would see as about 4 lanes were, at times, 12 cars wide. In that, the scooters, mopeds and motorcycles were weaving through all the traffic, in front of cop cars, buses, each other. It didn’t matter if it was at a traffic light, stop sign or while traffic was moving. It blows our minds. After the river cruise we took a tour around the city, in the dark, on the bus. We saw parts we saw last year, this year and things we hadn’t seen before. Man, we love that town. That’s a lot of info to slam on you at once, so I guess it’s time to take a break, but don’t worry, more is coming soon!